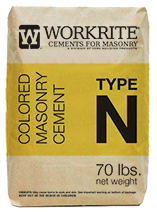 WORKRITE® Colored Masonry Cement is produced using Portland cement, limestone, iron oxide pigments and other materials to produce a variety of colored mortar products. Each formula is created with the utmost care and consideration to ensure that the integrity of the mortar product conforms to ASTM requirements and the standards of the masonry industry. Type N should only be used for above-grade construction and is recommended for exterior brick and block veneers. A stronger mix, Type S can be used above or below grade. 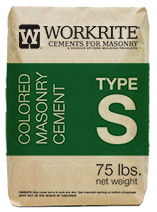 Our strongest mix, Type M is designed for below-grade or where additional compressive strengths are required. *Type M cements are available by custom-order only.